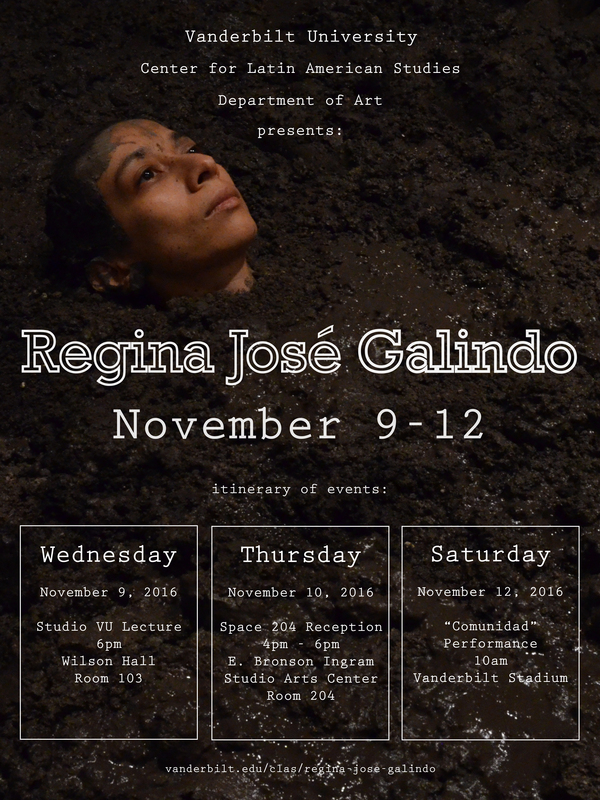 Regina José Galindo, an internationally recognized performance artist from Guatemala, will be in residence at Vanderbilt University the first two weeks of November. Galindo uses her own body as artistic material to show how state violence impacts the bodies of women and racial minorities across the globe. Her bold work enacts violent histories and insists on memory as a weapon against social injustice. Through embodied performance she creates visual metaphors that make visible and resist unequal power relations. Her world premiere public performance piece, entitled Comunidad, will take place at 10:00am on Saturday, November 12 at the Vanderbilt Football Stadium. Galindo calls on the Latino community of Nashville to join her in the creation of this exciting new piece intended to showcase the resilience of the Latino community. “More than an image,” Galindo sets out to “generate a real experience of the strength of community.” A video of her call may be found at www.vanderbilt.edu/clas/regina-jose-galindo. 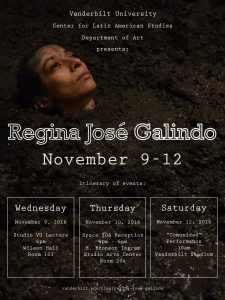 Regina José Galindo, artista de Guatemala internacionalmente reconocida, estará en residencia en la Universidad de Vanderbilt las dos primeras semanas de noviembre. Galindo usa su propio cuerpo como material artística para mostrar cómo la violencia del estado impacta los cuerpos de las mujeres y los grupos racialmente oprimidos de todo el mundo. Su trabajo inquebrantable promulga historias violentas e insiste en la memoria como arma contra la injusticia social. A través de arte de performance crea metáforas visuales que resisten a las relaciones desiguales de poder. These events are co-sponsored by the Department of Art and Center for Latin American Studies at Vanderbilt University. 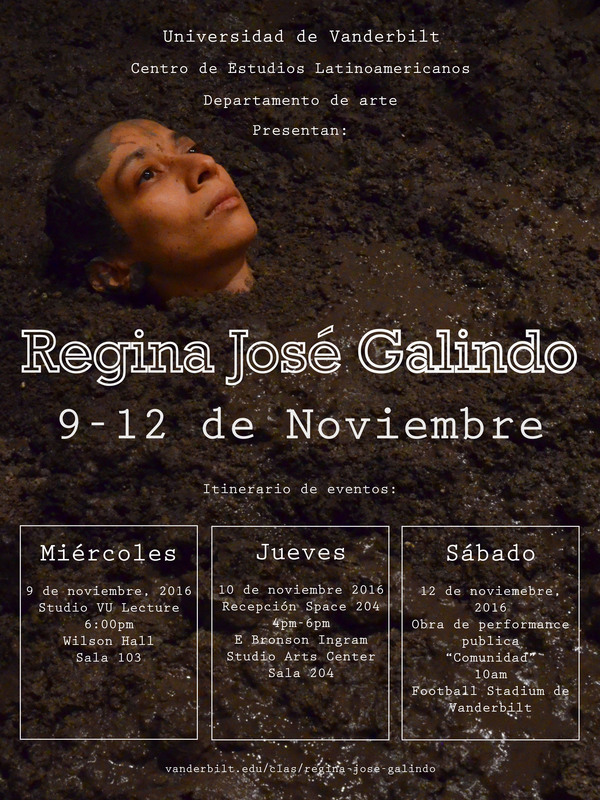 An internationally recognized performance artist, Regina José Galindo was born in Guatemala and lives in Guatemala City. Her work explores the universal ethical implications of social injustices especially those related to racial and gender discrimination. She has received major international awards for her body art, including the Golden Lion award at the 2005 Venice Biennale for a young artist under 35, the Grand Prize at the 2011 Biennial of Graphic Arts in Ljubljana, and a 2011 Prince Claus Award. Her work is included in important collections such as the Solomon R. Guggenheim Museum in New York City; the Castello di Rivoli Museum of Contemporary Art in Turin, Italy; Daros Latinamerica Collection in Zurich, Switzerland; the Blanton Museum of Art in Austin, Texas; MEIAC in Badajoz, Spain; the Museum of Contemporary Art and Design in San José, Costa Rica; and the Pérez Art Museum Miami. 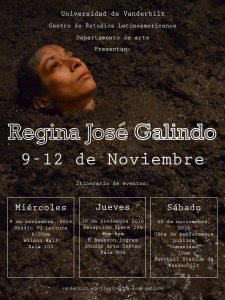 Galindo is the most widely recognized member of a group of young women poets and artists who, in response to the amnesia of Guatemala’s post-dictatorship culture in the late 1990s, turned to performance art as a means of recovering cultural memory. She composed her signature work ¿Quién puede borrar las huellas? (Who Can Erase the Traces) in protest of General Efraín Rios Montt’s 2003 presidential candidacy. Wearing all black, Galindo walked barefoot from Guatemala’s Constitutional Court to the National Palace, carrying a white basin of bright red human blood. Every few paces she would dip her feet into the bowl, leaving the trace of her bloody footprints. The eloquent procession testified to the living memory of genocidal war crimes, precariously memorializing the dead left in Ríos Montt’s wake. 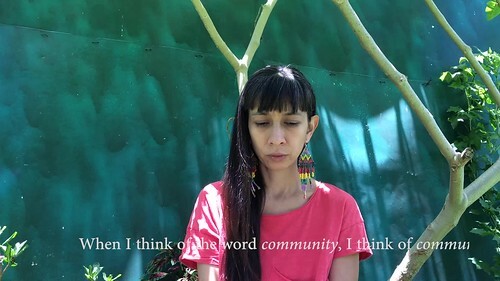 In a more recent performance, La Verdad (The Truth), Galindo read from the testimonies of dozens of Maya Ixil women who witnessed atrocities committed by the armed services during the civil war. Seated at a small wooden table with a microphone suspended near her mouth, Galindo read from the translated transcripts of the April 2013 trial charging General Efraín Ríos Montt with acts of genocide. Facing the audience at the Centro Cultural de España in Guatemala City, Galindo’s reading was repeatedly interrupted by a male dentist who crossed the stage to anesthetize her mouth. Her speech, which began resonant with restrained pain, grew increasingly slurred and inaudible over the duration of the seventy-minute performance. 25th Avenue Garage on the corner of 25th Avenue and Highland Avenue. 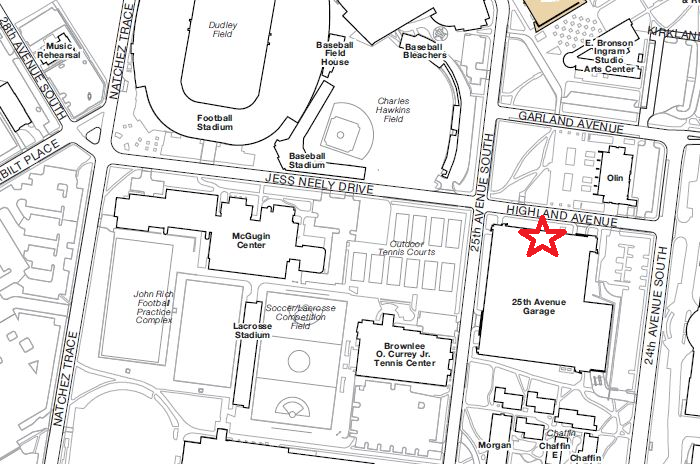 Please use the Highland Avenue Entrance. Upon entering, turn right and park in any space. Parking is free.